Insects exhibit a variety of behaviors or adaptations that help them to survive the harsh conditions of winter. 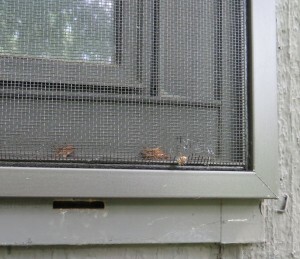 One that can be quite frustrating to homeowners belongs to the the group of insects we call “overwintering pests.” These organisms survive winter by taking refuge in South or West facing cracks and crevices, which maximizes exposure to the warm sun and buffers them from wind and freezing cold. While trees and rocky hillsides provide overwintering sites in nature, man-made structures that now dominate the landscape are perfectly acceptable to these insects. The Culprits. 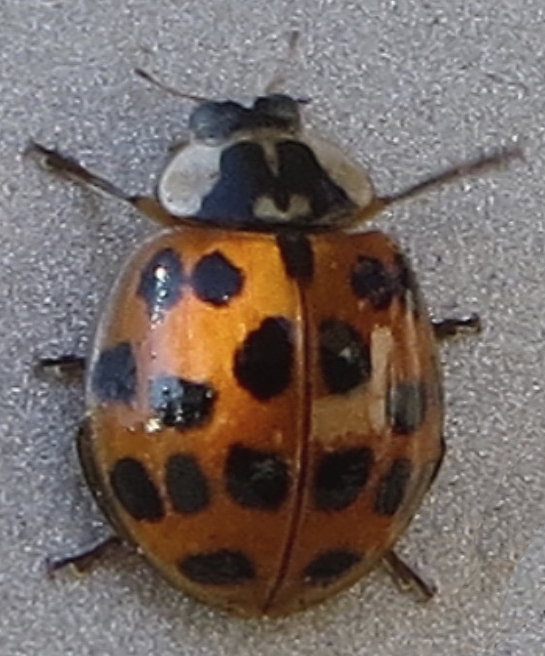 Multicolored Asian ladybird beetles, boxelder bugs, western conifer seed bugs, cluster flies, and the brown marmorated stink bug are common fall invaders in the Northeast. Some of these insects are exotic invasive species that were accidentally introduced to the US, such as the stink bug, which was first identified from samples collected in Allentown, Pennsylvania in the 1990’s. A new insect, the kudzu bug, was introduced to Georgia in the early 2000’s and may soon invade homes in the Northeast. Using an appropriate sealant labeled for doors and windows, seal exterior gaps that could allow entry into the home. Remember to inspect locations where wires, pipes, and other utility lines enter the structure, especially on the South and West facing side of buildings. Look for and seal gaps around window and door frames. Make sure that screens are tight fitting in the window frame, and they do not have any tears. Keep attic doors and fold-down stairs closed during winter months. Insects can enter attic spaces through soffits, later entering the livable space when they are attracted to lights and heat. Flues should be closed in the fireplace when it is not in use. Trapping Pests. 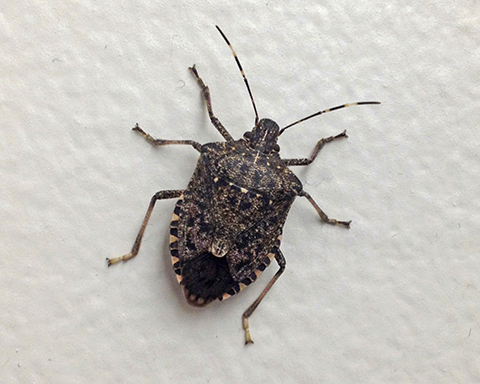 On warm winter days, stink bugs and other overwintering pests may become active. During the day, they can be found at windows, while at night they may fly towards artificial lights from the television, computer or lamps. One indoor trap type that is easy to make and effective is a pan trap. 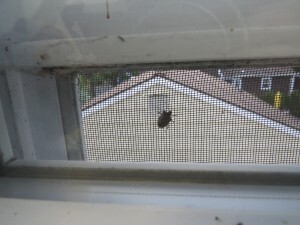 Read more about this device here: Stink bugs beware! 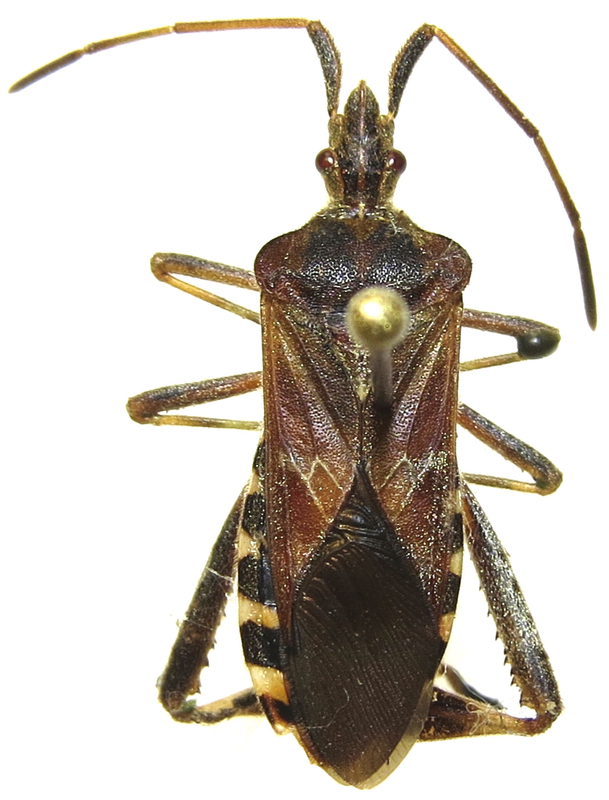 Homemade stink bug traps squash store-bought models, Virginia Tech researchers find. The shield-shaped adult brown marmorated stink bugs (BMSB) are between ½ to ¾ inch long with grayish-brown speckling on the top and bottom. “Marmorated” refers to the light and dark bands along the edges of the body. Now (April – May) is the time that they emerge from their overwintering places in our houses to mate and lay eggs through the summer. Although the BMSB is not a threat to human health, people become alarmed when large numbers invade their homes (and even hotel rooms). Note the light and dark bands along the edge of the body. Unwelcome, but not demanding: Indoors, BMSB do not form a nest, do not feed, do not reproduce and do not cause damage to the structure. Northward (or Eastward) Ho! 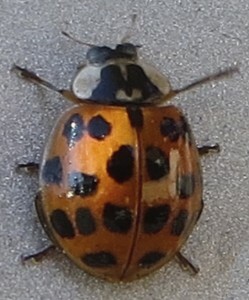 The majority of insects will enter on the south or west facing side of a building, which are warmed by afternoon sunlight throughout the winter. Just pretend we’re not here: Once inside, they will hide in protected and dark places, such as wall voids, folds of curtains, and furniture. They stink! While they do not form health risk, they will give off an unpleasantly pungent smell if crushed. Build them out: This summer, seal cracks, crevices, corners, and other dark areas around windows and doors, gutters, flashing, etc. with a highly elastomeric sealant. It’s spring! Time to go! See The Unwelcome House Guest: Brown Marmorated Stink Bug —A Guide for Residents, Property Managers, and Pest Management Professionals fact sheet for more information on BMSB and how to manage them. … Never. This post was slated to go live the same day Uncle Sam started surcharging tardy tax returns. Then — human error took over. You don’t have to step back in time, though, for this post to help you — it’s as relevant now as it was on April 15. And it’ll stay relevant year-round. Still, as with so many IPM tactics, the sooner you start the better. While Uncle Sam is busy reviewing your 2012 balance sheet, why not take a close look at your IPM 2012 “balance sheet”: your notes or scouting records? Sure, last year’s pest diary can’t predict what will hammer you this year. Still — other than new pests on the prowl, the pool of potential malcontents doesn’t differ much from year to year. You can learn a lot from reviewing which pests harassed you most (or gave you a break). Especially — if your records say what conditions tended to make problems worse. Did pests blow in on storm fronts from points south; were fields too wet too late; did Jack Frost leave a calling card when you least wanted it? Conversely, your records could show which growing conditions hammered pests on your behalf. With all that as your backdrop, what did you do about troubling pests? How well did your tactics work? What did you learn; what could you build on (or do differently) this year? If your records go back several years (a decade would be gravy), you’ve got lots of good material to draw on for evidence-based, least-toxic decisions about what to do when nature throws you a wild card. Whether you’re a farmer, landscaper, groundskeeper, or gardener, we’re right there to suggest what cards to play. Tune into our timely pest forecasts, trap networks, and field reports to get a heads-up on what’s headed your way. And tweak the cultural and scouting practices that — for instance — favor healthy plants that shrug off disease or let you know that a pest’s natural enemies are about to take command. IPM helps you make those evidence-based decisions — decisions that emphasize, for instance, resistant plant varieties, sanitation, the right nutrients at the right time, or pheromone traps that act like “come-hither” baits for pests otherwise intent on eating your crops. Prevention, in a word. And while you’re at it — why not review our research reports to see what we’re learning? Example: maybe your records show you spent $60± per acre on preventive fungicides for field corn — fungicides that, according to belief, also promote higher yields. Or do they? We did the work and the math on a real-world farm and we’re thinking — not so fast. Because in this case, the farmer would take a hit of about $40 per acre on sprays that didn’t really improve yields all that much. warehouses, concession stands, or rental properties you care for. Maybe last fall you saw way too many yellowjackets at the dumpster — but you can take steps early to prevent more of the same. 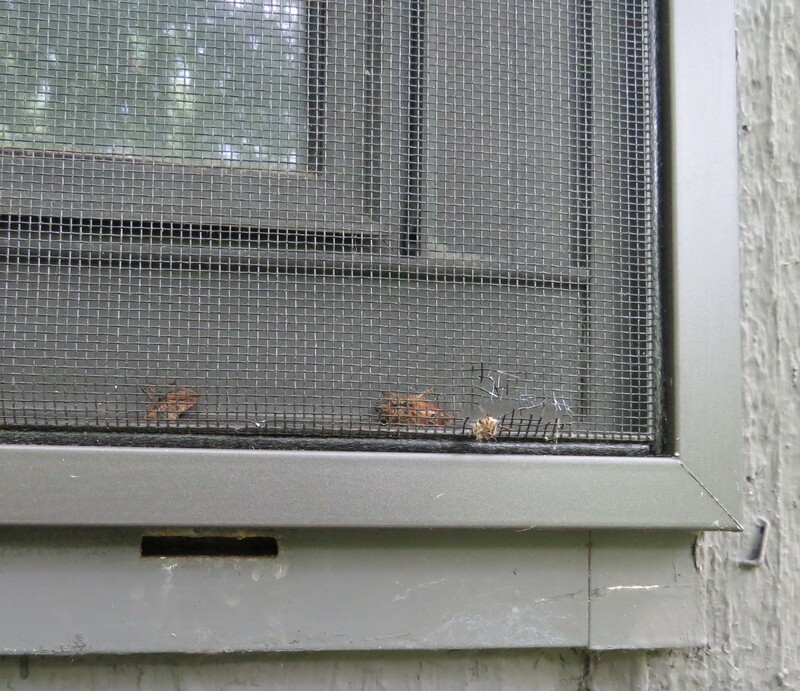 Similarly, you’ll want to scout early whether it’s ants, stink bugs, cockroaches or mice knocking at your door. The operative word: early. Which is why this review matters so much. Because late may as well be never.